In this post I’ll be investigating compressed sensing (also known as compressive sensing, compressive sampling, and sparse sampling) in Python. Since the idea of compressed sensing can be applied in wide array of subjects, I’ll be focusing mainly on how to apply it in one and two dimensions to things like sounds and images. Specifically, I will show how to take a highly incomplete data set of signal samples and reconstruct the underlying sound or image. It is a very powerful technique. The $L^2$ norm is nice because it is easily calculated, easily differentiated, and it has intuitive appeal (e.g., the norm of a vector is its length). A lot of very important algorithms and methods rely on the $L^2$, including least squares fitting. Instead of squaring each element, it simply takes its absolute value. Although the absolute value is annoying in the sense that it often introduces discontinuities in its derivatives, it does have some unique properties when compared to the squaring that takes place in the $L^2$ norm. Compressed sensing is all about exploiting these properties. Let’s visualize some data with Python to see what I’m talking about. where $\epsilon$ is some normally distributed error with standard deviation $\sigma=0.1$. Now let’s fit two lines to the data samples. For the first line, we’ll use the $L^1$ norm as the criterion for a good fit; for the second line, we’ll use the $L^2$ norm. Notice that both of the fits seem to do a pretty good job fitting the data. Sure, they don’t line up exactly, but they both are reasonable approximations given the noise. Now, let’s get a tad crazy and add some outliers. In other words, let’s perturb a couple of the points, moving them far away from the lines. This isn’t actually all that out of the ordinary if you think about it. Outliers frequently occur in real world data, causing all kinds of headaches. When we re-plot the $L^1$ and $L^2$ fits we see something interesting: the $L^1$ fit remained true to the overall trend in the data, while the $L^2$ fit seemed to get “corrupted” by the outliers. Why does this happen? It comes down to the fact that $L^2$ error gets squared, while $L^1$ error does not. When you fit a line to data using an $L^2$ interpretation of error, the displacement of outliers has a disproportional impact because their already-big errors are get getting squared. 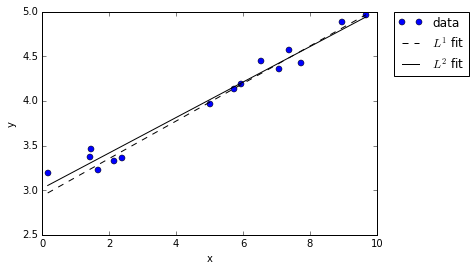 Just look at the distance of the two outliers in our example and imagine squaring them – of course it’s not surprising that the $L^2$ line gets skewed! 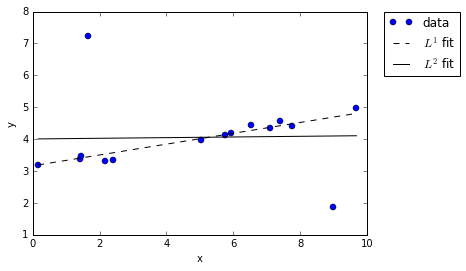 However, when using an $L^1$ interpretation of error, the outliers contribute no more than their displacement. The result is a cleaner fit that more closely matches our intuition of what a good fit should look like. It’s this interesting property that opens the door to compressed sensing. In this example (borrowed from Kutz1), we will create an artificial sound wave, sample 10% of it, and reconstruct the original signal from the sample of 10%. This is one dimensional compressed sensing. First, create a signal of two sinusoids. In the plots above, we see that the signal has a clear pattern, yet is non-trivial. The plots in the top row are of the signal in the temporal domain at different scales. The plots in the bottom row are of the signal in the spectral domain (i.e., the signal’s frequency content). Considering the frequency domain in particular, we note that the spectrum is mostly zero except for the two spikes representing the two sine frequencies. Now imagine sampling 10% of the temporal signal (see below). You’d have a data set that, to the naked eye, would look like nonsense. The underlying signal is would still be the same, as would be its frequency content (mostly zeros, with the exception of two spikes). One might ask if it is somehow possible to extract those two dominant frequencies from the incomplete data so that we might reconstruct the signal? The answer is yes! Compressed sensing in this context is made possible by the fact that the signal’s frequency content is highly sparse. This is where the $L^1$ norm comes into play. What we want to do is, out of all possible signals, locate the simplest one that matches up with the known data. In other words, we want to use a minimization routine to find a set of frequencies satisfying two conditions: (a) the underlying signal matches up exactly (or as closely as possible) with that of our data; and (b) the $L^1$ norm of the frequencies is minimized. Such a routine will yield a sparse solution – exactly what we want. In Python, there are a couple ways to accomplish this. Perhaps the easiest is to utilize the convex optimization library CVXPY. Use the code below to minimize the norm of the signal’s frequencies with the constraint that candidate signals should match up exactly with our incomplete samples. You might be asking: what the hell is that $A$ matrix? Well, it’s the key to the whole party. Let me explain. Specifically, we want to derive a matrix $A$ that can be multiplied with a solution candidate $x$ to yield $b$, a vector containing the data samples. In the context of our current problem, the candidate solution $x$ exists in the frequency domain, while the known data $b$ exists in the temporal domain. Clearly, the matrix $A$ performs both a sampling and a transformation from spectral to temporal domains. So, $A$ is simply made up of rows sampled from the domain transform matrix $\psi$. The $\psi$ matrix is easy to construct – it is the inverse discrete cosine transform acting upon the columns of the identity matrix. The matrix product $\psi x$ is the equivalent to doing idct(x). Now that we’ve constructed the $A$ matrix and run the minimization, we can reconstruct the signal by transforming the solution out of the frequency domain and back into the temporal. Below, on the left, is the original signal and its frequency content. On the right is our $L^1$ approximation. I’d say that’s pretty good for only using 10% of the data! One problem that stands out is that the quality of the reconstruction degrades noticeably at and around $t=0$. This is probably due to our sample interval violating the periodic boundary condition requirements of the cosine transform. Of course, given an arbitrary signal sample without any prior knowledge of its nature, it would be hard not to violate periodic boundary conditions. The good news is that now we have some very clear indications of the true signal’s frequencies. If desired, we could go back and resample the signal within an interval that satisfies periodic boundaries. Now let’s use what we learned from the 1-dimensional case to do compressed sensing in 2-dimensions. This is where the real fun begins because we can now try and reconstruct images. Below, we will use exactly the same methodology as before to randomly sample and reconstruct the image Waterfall by M. C. Escher (approx. 1200 by 1600 pixels). Due to memory limitations imposed by the $A$ matrix, we’ll start off by considering a downsized version of the image (approx. 50 by 65 pixels). In the section that follows we’ll extend the routine to handle large images. Either version can be made to work, but I feel like the first one is cleaner because it naturally keeps the matrix operator in front of the operand. Whenever I refer to the dct or idct, assume that I mean the axis=0 variety. As in the previous section, we’ll take a random sample of image indices, forming our $b$ matrix. Then, we’ll generate our $A$ matrix. Creating the $A$ matrix for 2D image data takes a little more ingenuity than it did in the 1D case. In the derivation that follows, we’ll use the Kronecker product $\otimes$ and the fact that the 2D discrete cosine transform is separable to produce our operator $A$. Clearly, the Kronecker product is our desired transformation matrix $\psi$. Therefore, our matrix $A$ becomes $A=\phi (D_n\otimes D_m)$, where $\phi$ is the sampling matrix. You can calculate the Kronecker product in Numpy with numpy.kron. The main problem with this method is that the Kronecker product can become truly massive very quickly. If your target image is $m$ by $n$ and you’re taking $k$ samples, then the $A$ matrix has a size of $(mnk)^2$. That said, for small images it will be fine. Reconstruct the signal and visualize! Okay, the results aren’t fabulous. The original image on the far left is barely intelligible as it is. Resolution was low, so we had to take a large-ish sample of 50% (the boolean mask is shown middle left; the masked image is middle right). Regardless, it is clear the procedure worked: the reconstructed image on the far right definitely approximates the original, be it poorly. Considering our working proof-of-concept, there are a lot of ways it might be improved. The Kronecker-based method, although easy to implement, proves unusable for large images. What other methods are there? Now all that remains is to code it up! After trying several different options, I ended up settling on using libLBFGS (written in C) for its OWL-QN implementation. To make it accessible from Python, I wrapped it using the C APIs for Python and Numpy. You can find my implementation at PyLBFGS. See the project README for installation instructions and basic use. Let me know if you encounter bugs. The nice thing about libLBFGS (and by extension PyLBFGS) is that you can define the objective function anyway you like. In other words, we aren’t constrained to follow the $Ax=b$ model blindly. All that matters is the we are able to calculate the norm of the residual squared and its gradient. We need not generate $A$ at all! The following code explains what I mean better than I could with words. Take special note of the evaluate callback passed to the OWL-QN algorithm. The fast C implementation of OWL-QN allows us to process samples of the entire Waterfall image without any scaling required. And instead of doing everything in gray-scale like earlier, we can now afford to process each of the image’s three color channels. The solution shown above really demonstrates the power of compressed sensing. The original, full-color image is shown on the left. The middle image is the random 10% sample. The solution image is on the right. Although the solution contains some noticeable blemishes due to bad color channel mixing, the overall accuracy is uncanny. Furthermore, with a little extra care and attention, those blemishes might be removed – either via post-processing (e.g., a Gaussian filter) or via an improved compressed sensing implementation that takes into account color channels. One possibility is to try and determine the probable color palette beforehand and then incorporate it into the compressed sensing routine. Just for kicks and giggles, I also included an image reconstructed from 1% of the available data. It’s definitely blurred, but nonetheless recognizable!